What does transportation funding defeat in Georgia say about Alabama? A common sight around downtown Atlanta. Ask any Alabama resident their thoughts of Atlanta and you will likely hear some common themes. Some in Birmingham will lament missed opportunities that the Georgia capital capitalized on to become one of the fastest growing cities over the past 50 years. Others along the Chattahoochee River might complain that Atlanta’s use of Lake Lanier as a source of drinking water has left cities downstream with fewer opportunities for economic, industrial, and recreational development. Some might reminisce about the 1996 Olympics, the city’s Civil Rights history or the Braves. One topic will almost always come up before any others are mentioned, however. The traffic. According to Forbes Magazine, Atlanta is the third worst city for commuters, based on transportation options, hours stuck in traffic, and distance travelled to work. 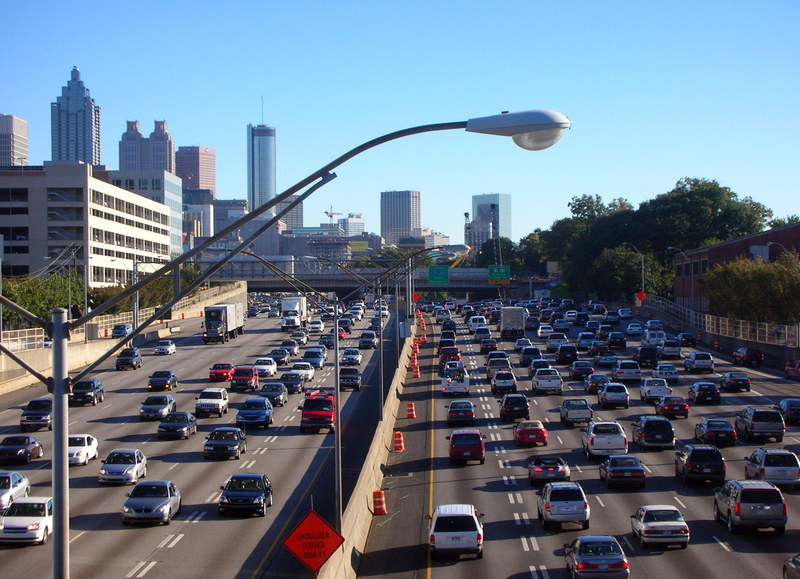 Atlanta’s traffic congestion, a result of over 80% of commuters driving alone, is a well-known inconvenience to Alabamians visiting the city. Georgia voters went to the ballot on Tuesday to vote on an ambitious transportation initiative that aimed to reduce that traffic congestion. The plan involved a one-cent sales tax increase over ten years to support approximately $8 billion worth of projects, including a new light-rail line, developing portions of the cities’ rail and greenway beltline project, expanding the MARTA bus system to include new routes and express service, as well as constructing new roads in the ten-county metro area. The result? 63 percent of residents in the ten-county region voting against the measure. The fact that only 5% of commuters use the region’s bus and train transit system has become a liability for future economic growth in the region. Lack of convenient transit options have left residents reliant on cars, which has exacerbated the problem of congestion. And that has gotten the attention of elected officials and business leaders. The belief that transportation improvements can make Atlanta more competitive in recruiting and retaining businesses and residents resulted in an assorted collection of local and national organizations supporting the sales-tax increase. Atlanta Mayor Kasim Reed has been championing this approach since his time in the state legislature. Companies such as Coca-Cola and Home Depot, along with the local chamber of commerce, voiced support for the measure because the region’s transportation problem makes shipment of their goods burdensome and inefficient. The opposition to the measure was perhaps even more diverse. The Georgia Tea Party Patriots called the measure the largest tax increase in the history of the state. The local chapter of the NAACP opposed the measure because it did not invest enough in projects that serve urban neighborhoods, and the Georgia Sierra Club campaigned against the initiative because they favored more transit expansion and fewer road projects. The traffic crisis in Atlanta illustrates that sprawl development that does not include transportation options is simply not sustainable. It damages our environment, harms our public health, and as businesses in Atlanta have discovered, inhibits economic growth. City and state officials in Alabama will likely take note that nine of the twelve regions in Georgia rejected the sales tax increase, illustrating the political necessity of using finite transportation funding to repair our deteriorating roads and bridges, providing low-cost infrastructure such as sidewalks and bike lanes, and funding transit systems that reduce reliance on automobiles. One proponent of the tax increase in the Atlanta area pointed to the role transportation infrastructure plays in attracting young professionals to cities such as Portland, Pittsburgh, and Denver and away from “dying industrial” cities such as Birmingham that lack diverse transportation networks. While the Birmingham area’s transportation problems are well-documented, local leaders are beginning the process of rebuilding our transportation network by adopting complete streets policies and supporting the Red Rock Ridge and Valley Trail System.